It’s not always easy for me to find time to make elaborate desserts. In fact, most of the recipes I make are pretty simple or can be done in several steps with lots of “breaks” in between. I think that’s why I was so drawn to making homemade marshmallows. They only require a few minutes of cooking and then several hours of resting to set up. That means more time for me play with our little guy & to tackle my never ending to-do list. I made a batch of these vanilla marshmallows to snack on, bake with and use in s’mores. They were practically effortless. I have to admit, at first I was a bit skeptical about how they’d taste. When pouring the base into the pans to set I kept thinking that there was no way they could be as good as the store bought ones. Boy was I wrong. They were better, so much better! These sticky little guys were like biting into a cloud. Soft, airy, melt-in-your-mouth good. I decided to cut mine up into several different shapes so that I could use them for different things. 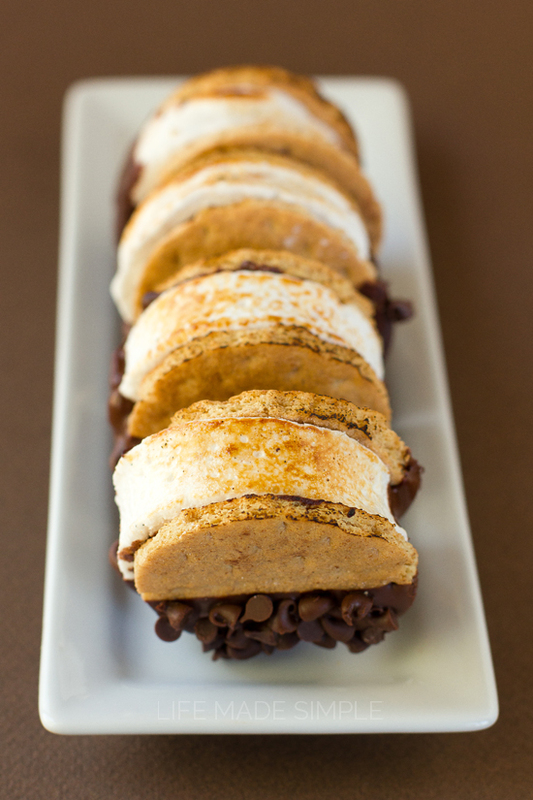 We were in the mood for s’mores so I put together these quick and easy s’mores moon pies. 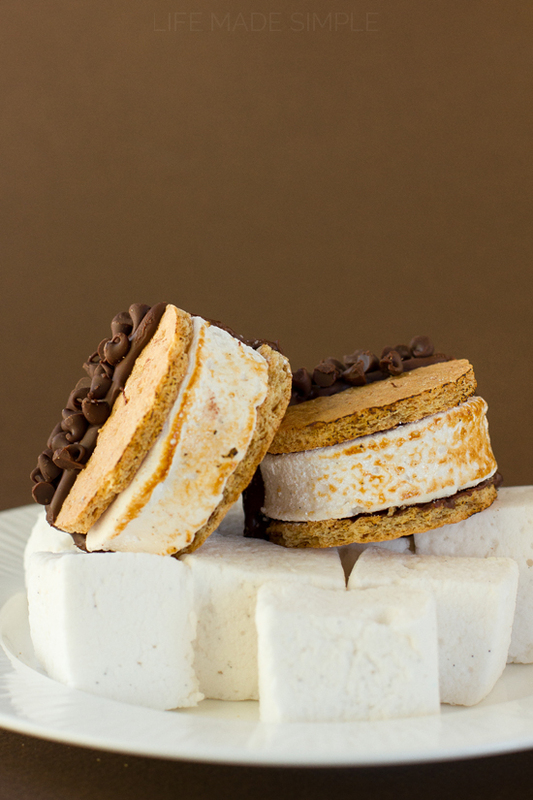 To make these s’mores moon pies with homemade marshmallows, you’re going to need a fresh batch of my vanilla marshmallows (recipe below). 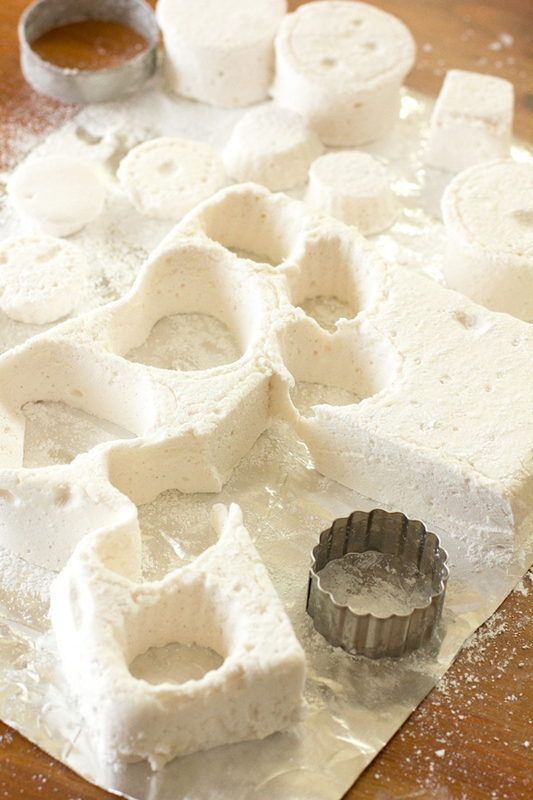 Turn the pan of mallows out onto a surface dusted in powdered sugar. Using a 2.5″-3″ circle cookie cutter, cut 12 circles out. Lightly roll the edges in the excess powdered sugar to prevent them from sticking to you or to each other. Next, using the same cookie cutter, cut circles out of 12 sheets of graham crackers. You need 24 circles to create 12 sandwiches. Now in a microwave safe bowl, melt 2 cups of chocolate chips. I chose to do a mixture of milk and semisweet chocolate, but feel free to use whatever chocolate you like. Add a tablespoon of coconut oil or shortening to the chocolate to help it harden. To assemble, spread a dime size amount on the bottom of each graham cracker. 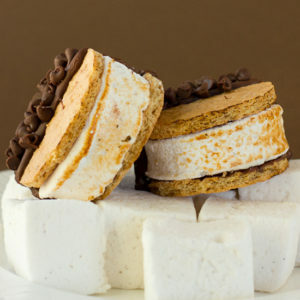 Sandwich the marshmallow in between so that the chocolate acts like glue. Allow the chocolate to set for 10 minutes before dipping half of the sandwich into the chocolate. 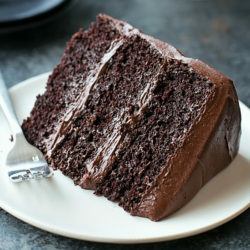 If you want to completely cover it, you will need to double the amount of chocolate. 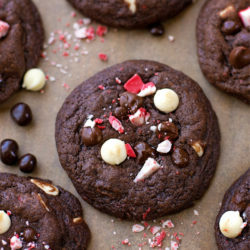 Sprinkle with mini chocolate chips or chocolate shavings. Allow the moon pies to set on a piece of wax or parchment paper for 10 minutes, then transfer them to the refrigerator to set for an additional 20 minutes. Once the moon pies are set it’s time to get toasty. Because they wouldn’t be s’mores without a little help from one of my favorite kitchen gadgets: the torch. Set the moon pie on the bottom of a stockpot and torch the marshmallow until it turns golden brown. The graham cracker might get a little crispy but that just makes these taste even better. Eat immediately because warm gooey marshmallows are simply the best! I hope you’ll give these fun little treats a try! Enjoy!!! 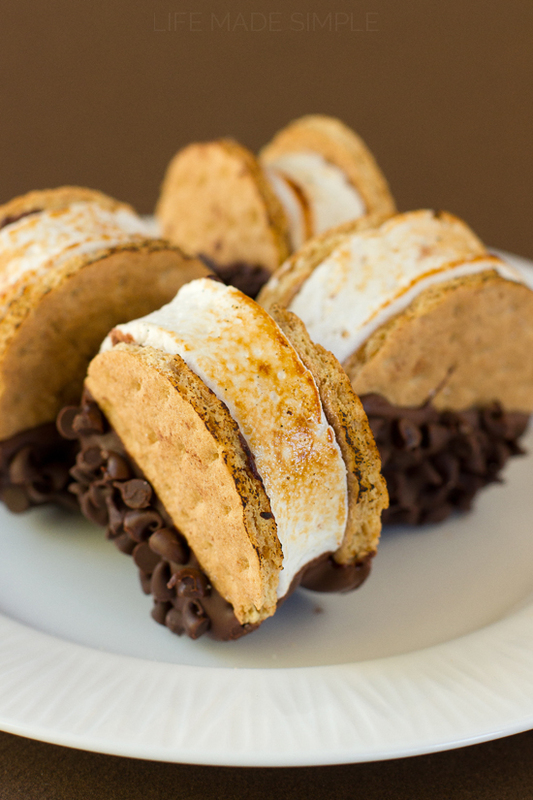 These indoor s'mores moon pies with homemade marshmallows will take you back to your childhood! They taste as good as they look! Use 1 tbsp. of butter to grease a 9x13 inch baking pan. Generously coat the pan with powdered sugar, saving the remaining powdered sugar for later. In a large saucepan set over medium heat, combine ¾ c. water, granulated sugar, corn syrup and salt. Bring to a boil and continue cooking until the mixture reaches 240 degrees (about 8-10 minutes). While the mixture is cooking, in the bowl of a stand mixer, add the remaining ¾ c. of water and the 4 gelatin packets. Using the whisk attachment, stir on low until the gelatin becomes soft and begins to "bloom." With mixing speed on low, pour the hot sugar mixture in, then increase speed to high. Beat until the mixture becomes stiff, about 12 minutes, add the vanilla and beat for 3 more minutes. Pour the mixture into the prepared pan and allow to rest for 4 hours or until firm (note: they will still giggle a bit when set). Once the marshmallows are set, use a knife and go around the edges of the pan. Turn the pan onto a surface COVERED in powdered sugar. Tap to remove. You should have a big sheet of mallows. Using a 2.5" to 3" cookie cutter, make 12 circles. Roll the edges in powdered sugar to prevent them from sticking. Save or use the remaining mallows. Next, cut out 24 graham cracker circles. In a 2 c. glass measuring cup, add the chocolate and melt in the microwave until it's smooth (being careful not to burn). Add the shortening or coconut oil. To assemble, place a dime size amount of chocolate onto the center of each graham cracker. Sandwich the marshmallow in between. Allow to set for 10 minutes. 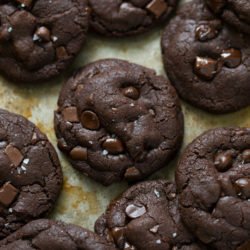 Dip the "sandwiches" into the remaining chocolate, set on a piece of wax paper and sprinkle with mini chocolate chips or shavings. Allow to set for 10 minutes before transferring to the refrigerator to set for an additional 20 minutes. Remove from the refrigerator, set on the bottom of a stockpot and torch the edges of the marshmallows with a kitchen torch. Enjoy immediately.